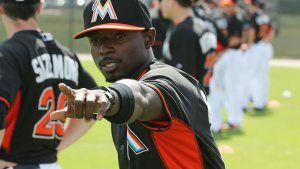 Ever since the Marlins acquired Dee Gordon in December, I’ve read one comment after another from the number crunchers complaining that the man who ranked 5th in the National League in hits a season ago doesn’t walk enough. In 2014, Gordon saw a higher percentage of strikes (49.5) than any hitter in the National Leagues. In the majors, only Dustin Pedroia of the Red Sox saw a higher percentage of pitches in the zone (51.8). Digging deeper, a check of the numbers available on Fangraphs.com tells us that Gordon swung at only 44.6 percent of the pitches he saw in 2014. Only 17 players in the NL swung less often. And 66 percent of the pitches he saw a season ago were fastballs, the 5th-highest rate in the majors, 4th-highest in the NL.